Over the last many years, I’ve seen that the amount of energy we as women spend trying to fix our bodies (or ourselves) could run a nuclear plant. There’s so much light and aliveness, so much power bound up into the weight issue that once released, we could do anything, everything — and we could use our voices to transform the troubling times we live in. This will be a class about redefining power, about using your inherent radiance and life force to transform your view of what’s possible — and to take out that into the rest of your life. Talking about this will be a first for me — and I look forward to speaking to all of you and hearing your questions. Women, Weight and Power: Releasing the Energy of Obsession is FREE for everyone who pre-orders my new book This Messy Magnificent Life (or has already ordered one) by May 4th. 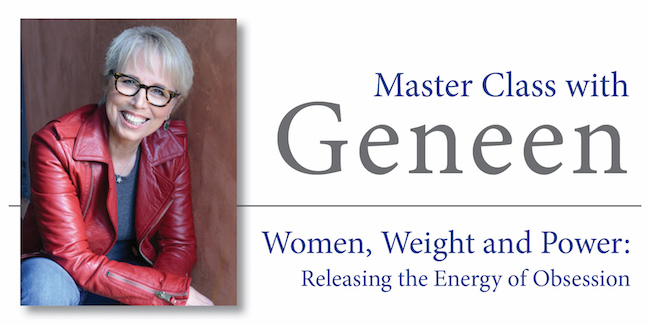 Click here to find out how to enroll: https://geneenroth.com/world-premiere/master-class-optin. And, of course: If you want to explore, understand, release the energy you have bound in obsession, come, come, come to the class.